Our first issue of our 5th year is a fantastic one that you won’t want to miss. 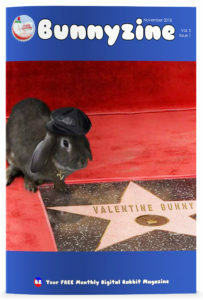 Our feature bunnies this month are Valentine and Penny from Valentine The Bunny. If you know them, then you already know their awesome photoshop movie, game, and music album parodies. They are so incredible, we added extra pages just to squeeze more of their photos into the issue! – And a compelling article titled “I gave up my dream job to keep my rabbit” which I highly recommend reading because it really made me think about others in the world who don’t have the same freedoms regarding pets as we do. If you'd like to support Bunnyzine, donations are welcome. They will be used to help us grow.